DJ Shortkut - Jan 18th...Where? 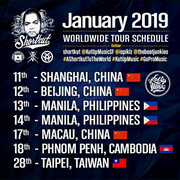 So DJ Shortkut of the Invisibl Skratch Piklz is back in PP for gig on the 18th Jan, can't find out where he's spinning at though...last time he was in town in 2016 he played at Nova. Anyone know? Re: DJ Shortkut - Jan 18th...Where?